One of the special things about the YMCA is that it is a place for all kinds of people. What you wear to work out shouldn’t be something you worry about at the Y—if you come in shorts and an old T-shirt, you’ll fit right in. If you like to walk the treadmill wearing khakis—you’re welcome to do so. These classes are designed to make you sweat by getting your heart rate up, so wear things that will help keep you cool. Think lightweight and wicking fabrics, which pull moisture away from your skin. 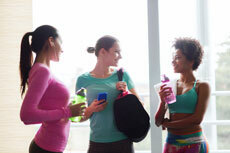 While you build and tone muscles, you’re still going to sweat, so like cardio classes, think lightweight and wicking. Additionally, you might want to wear clothing that isn’t too loose, so that as you’re lifting you can see your form and so that you don’t get caught in a flowy shirt. Some people wear gloves to strength classes to help protect against calluses—however, they aren’t required. If you’re heading to a stationary bike, it’s a good idea to wear tight pants or shorts so that you’re free to move on the bike and aren’t getting caught on anything. Bike shorts with extra padding in the seat can be helpful, as can clip shoes—although neither are required. With a variety of dance styles taught in Y classes, there’s a big range of styles that people typically wear to class. The key is to wear what you feel good in—that might be capris and a tank top, shorts and T or a dance dress. It can be helpful to wear a cross-training shoe with cushioning to help with the impact of dance moves. And although running shoes work just fine, cross-training shoes offer more support for lateral movements. For these classes, you’re encouraged to be barefoot and often use a yoga mat. You can bring your own mat, or rent one from Member Services. Bringing layers is a good idea, so that you can be cool during more intense periods of class and warm enough during cool-downs. For women, it’s a good idea to wear a tighter shirt (at least in the base layer) so that during any inverted poses, you aren’t worried about your shirt slipping to show more than you want. Wear clean, family-appropriate swim attire—clothing may be worn over a swimsuit (there may be water-depth restrictions if you opt to wear clothing over you suit). Water shoes are encouraged, but not required. Wearing a life jacket is optional, but not required—although some water classes do require that you wear a YMCA-provided flotation belt. When sending your little ones to class, they should be dressed like they would be for gym class—that means no sandals in the summer or boots in the winter—tennies are best! No matter what, your workout isn’t intended to be a fashion parade. If you’re comfortable in what you wear to work out, and you follow the member guidelines for attire, you’re all set.